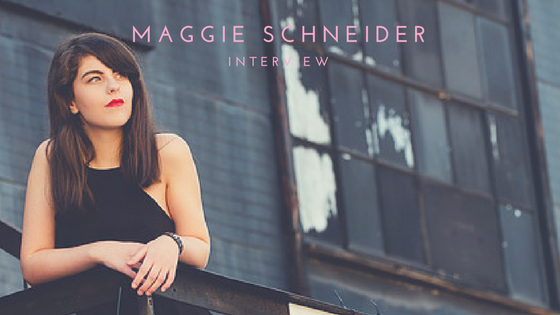 For Maggie Schneider, her first stage performance in Annie at age four is where her musical journey began. By age 12, she transitioned from just performing in theater to also performing as part of a rock band program. It’s the last three years, however, that’s she’s taken her performing and songwriting more seriously. Her latest EP, Tinted Glasses, was recorded at Track Happy Studios in Nashville last June. After visiting the studios to record with Atlanta alt-rock band The Everyday Anthem, Schneider was invited back by studio owner and All Time Low drummer, Rian Dawson, to record her own tracks. As a huge fan of All Time Low, recording Tinted Glasses with Dawson was an opportunity too good to pass up. Schneider originally sent him 12 demos she wrote a year ago, and with his guidance narrowed them down to four. In a weeks’ time, they had tracked all four songs: “695 North Avenue”, “Chuck Bass”, “Tinted Glasses” and “Break”. The first single, “695 North Avenue”, is about Atlanta music venue The Masquerade. Although it no longer resides at that address, the venue holds many memories for Schneider. From seeing concerts of all genres and making lifelong friends to performing there countless times, The Masquerade is more than just a building; it’s a keeper of memories. The second single, “Chuck Bass”, shows Schneider’s bold side and gets creative in its comparisons of the fictional character to real-life scenarios. Despite her love for the show Gossip Girl, “Chuck Bass” is about female independence and how a girl can’t be bought – she craves honesty in a relationship over material things. The title track, “Tinted Glasses”, is more about feeling lost in a relationship and feeling it spiraling but wanting to hold on and remain hopeful that it will work out. It’s about realizing how much time has been spent dedicated to the relationship and the moments shared, and trying to hang onto the person because of that. The name stuck as the EP title as it’s the most personal track, and one that she feels is the best at getting her message across. The last track, “Break” features one of Schneider’s friends and lead guitarist of The Everyday Anthem, Alex Crain. The song was co-written by the duo and shares a similar theme to “Tinted Glasses”. It’s about trying to start fresh in a relationship but there are pitfalls that stay between the people involved. Each of the four tracks shows Maggie Schneider’s love for love songs and openness to discuss feelings of hopefulness and hopelessness. With her release of Tinted Glasses, her time to shine beyond 695 North Avenue is now.